I had a conversation with an associate where I was discussing business, marketing and how to draw clients in the 21st century. She has a small niche business she’s trying to grow as I’m working on my own and we were comparing notes. She mentioned that it sounded like I’d escaped the system. I found it odd but thinking on it I realize that it’s living in a city with so much tech industry. People often work for large corporations like Dell, Apple etc. Workers are concerned about downsizing, losing jobs and have high stress levels but I seem relaxed comparatively. My choice to focus on healing work does not equal all joy with no work or stress. I’ve no insurance and have lived hand to mouth for the entire 10 years I’ve worked as a Thai massage therapist. Many times I’ve wanted to choose another field that would offer security, benefits and the chance at a better life but when I sit to think what I’d do, farmer is the closest to what I would choose. Healing work isn’t a job, it’s a calling. I do it because I’ve no other choice, not in the sense that it’s hopeless but in the sense that I simply have to follow my heart. Part of my stress is seeing others like tech workers who’ve made choices that they deem necessary but then come to me with large amounts of stress and back pain. For ten years people have told me how much they hurt and ache, how little money they have and the untold amounts of time and energy pressure they’re under to keep performing in whatever roles they’ve chosen. I accept it, just comes with the job but usually I’m telling clients in a small humble way to change your life. Then you’ve no stress or at least less. A client was late today and I had about 40 minutes of alone time before his Thai massage. I hung out, doing forward bends opening my hamstrings and breathing. A few downward dogs, half moons and headstands down the road then I did half downward dog against a wall. Upon standing I realized I was more calm, more balanced and my nervous system was free. It’s not bad for a break at work. I get to do yoga for a living. It doesn’t yet buy a home but that’s a matter of time. Breaking the mold will help you escape the system. Think outside of the box, follow your dreams and let no one tell you that it’s impossible. Most who say it cannot be done have simply never tried. 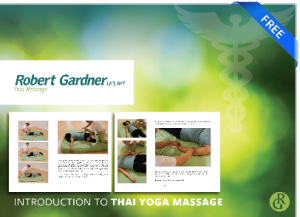 Teaching Thai massage What is Thai massage?